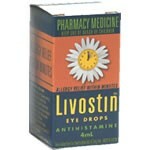 Product Use : Livostin eye drops are used to relieve watery, itchy or red eyes caused by allergies. Livostin contains levocabastine 0.5 milligrams per millilitre. Adults and children: the usual dose is 1 drop of LIVOSTIN eye drops in each eye, twice daily. The dose may be increased to 1 drop 3 or 4 times daily. You are breastfeeding, or intend to breastfeed . You have, or have ever had kidney disease.